The Hilton Athens is located in the heart of the city offering 506 spacious rooms and suites, spa with fitness center, heated indoor and large outdoor pools, four restaurants, two bars and exceptional views of the Acropolis and city skyline from rooms and rooftop Galaxy Bar. Steps from the Metro Station and convenient to the National Art Gallery, Athens Concert Hall and the Kolonaki Shopping District. 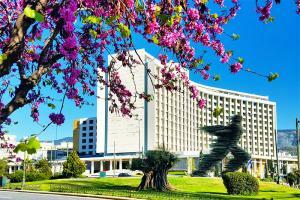 One of the most popular hotels in Athens. Located in the city center, approximately 19 miles from the airport. The metro station is a three-minute walk from the hotel.